It was a dreary last week of Barspotting but we forged ahead. It was also a wet day for Kansas State, so it was quite alright that we were late to Little Woodrow’s in Southpark Meadows. It was Championship Weekend and the cards played out, with the bowl season right at our front door now. Every game had a championship feel except for Farmageddon because when Kansas State and Iowa State get together, it means so much more. So how did we survive the first real wet weekend here in Austin, Texas? As I mentioned we got in a little late but that was also because we thought Little Woodrow’s opened up at 11:30 AM. We lapped the place to finish our coffee and headed in, with the place being open shortly after 11. The 6th Street version of Little Woodrow’s was a little short ceiling wise and felt somewhat cramped. The Southpark Meadows variety was tall and open. That helped facilitate a giant projection screen in the middle of the bar. But there was so much more there. Walking up to the joint, I could tell right away that there was a huge open patio area. I think South Austin reigns supreme in bringing not only a sports bar feel but a backyard feel to spectating. Although it was raining, I could tell that they had plenty of bags, horseshoe, and washer courts built in, not unlike Doc’s Backyard. Inside, there of course was the big projection screen television, but also large flat screen hd televisions. The bar section was wid open and had plenty of seats, the table area looked comfortable. I’m a little worried that the screens were too high. That’s fine, they had a bunch of other things to keep my attention at bay. Wireless internet reigned supreme for me while I checked up on scores as well as email. The games inside were decent. 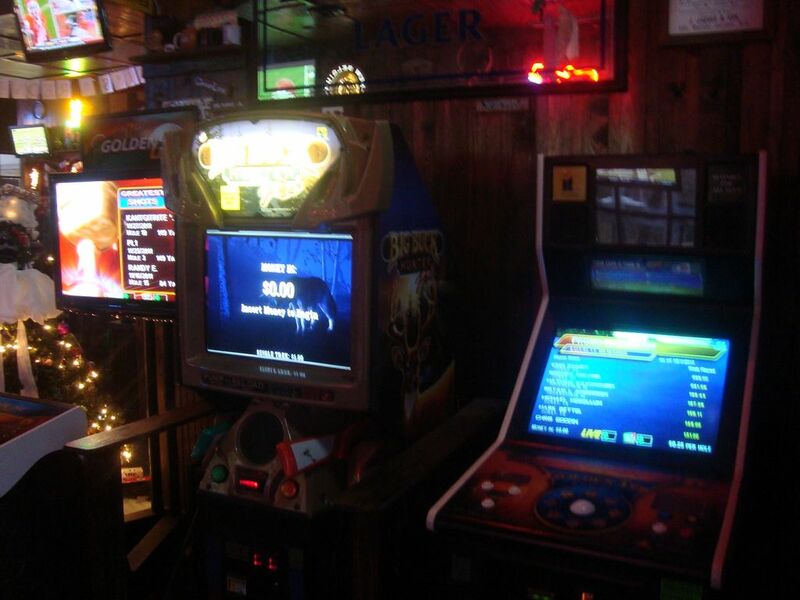 Little Woodrow’s has Golden Tee, Silverstrike Bowling, and some Buck Hunter. I missed out on the shuffleboard table at first sight but caught it on the way out. I also caught their themed Christmas, which saw beer bottle trees, wrapping paper decor, peppermints, and hanging clothes. Apparently, it was part of their redneck Christmas celebration. Oh, also at the bar, there was Mega Touch. I haven’t seen that around these parts. So speaking of the bar, the service was decent. The lady that tended to our needs most of the day was mildly attractive and kept calling us sweetheart. I dug her sense of humor so it wasn’t too much of an issue. What I did have an issue was that she messed up our order. The bar was fairly empty because Texas hadn’t started so it should’ve been easy to take down the correct order. I also had some issues getting the Kansas State game on television because she was convinced it wasn’t on there. Even after inspecting the line up sheet, she reluctantly changed the channel to the game. I didn’t make her eat crow on that, but it was disappointing nonetheless. It turns out screwing up the food order helped me out. 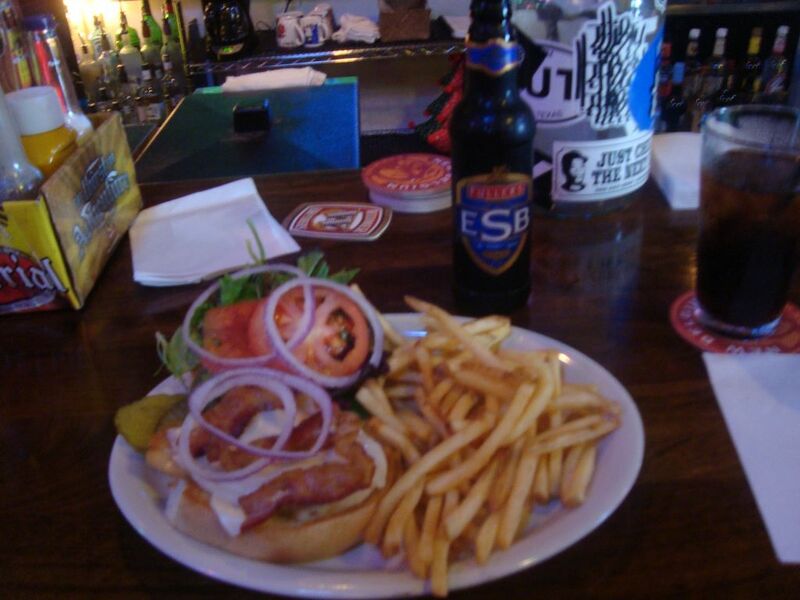 I opted for the their chicken sandwich with swiss cheese and bacon. Now I ordered the Little Woodrow’s homemade potato chips but they brought out fries instead. The bartender fixed the order and I got both. Both the fries and home-made potato chips were very delicious. I think it was the oil they cooked it with. The sandwich itself was okay, but nothing worth the price they were charging. I washed the thing down with a fairly tasty Fullers ESP. It tastes like a heifeweisen but was just a little more fruity. That light blend worked well with the chicken and juicy bacon. Now on to the games. It was championship weekend and it should’ve been renamed blowout weekend. Most of the conference championship games were blowout snooze fests (sorry Big 10, I just don’t care about you). Southern Miss pulled the upset over Houston in the Conference USA game. LSU took care of business against Georgia in the SEC game. Clemson got revenge on Virginia Tech in the ACC game. The games themselves were not that exciting, but it did have some hefty effect in terms of BCS allotment. Especially that Houston and Virginia Tech loss. It helped make a case for Oklahoma State. Yes, Oklahoma State beat Oklahoma for the first time in forever for Bedlam. Now, it wasn’t a conference championship game but it ended up being that way for the Big 12. Whoever won that game would have the title or at least the greatest share of it. The ghost of Sooner past didn’t scare the Cowboys away this time. They came out the gates firing and didn’t let up one bit. Oklahoma looked sloppy, especially on offense. I swear the defense might have scored more points than the offense in that game. Congratulations on the Big 12 Conference Championship Oklahoma State. Kansas State was the team I came to Little Woodrow’s to see and they finished out the regular season like they do with every game this year: by nearly giving me a god damned heart attack. It was close, thanks to Paul Rhoads and his rag tag bunch of Iowa State Cyclones. Farmageddon always had a history of close and exciting games and this one came through. Now Collin Klein will get the rub for the victory, but John Hubert’s stiff arm from hell toward the end of the game made him the top performer for me. That last touchdown run sealed it after Iowa State had multiple winning gambles on the drive to tie the game. So that was the last barspot. To tell the truth, I am still disappointed that I couldn’t get a game of washers in. I drowned my sorrows quickly with some homemade potato chips and malt vinegar, however. 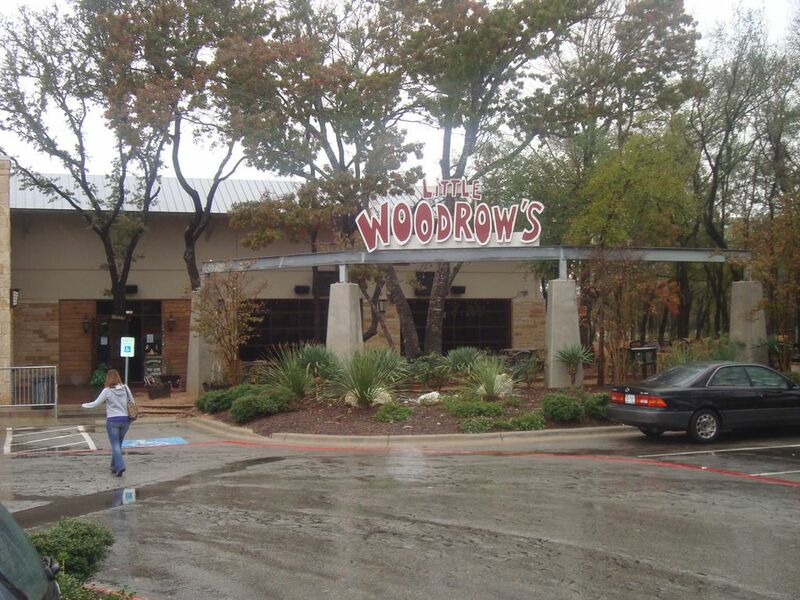 Little Woodrow’s was a decent time, but not the best. It could’ve been the rain or the sub par service, I’m not sure. What I am sure of is that if the sun is out and your favorite team is on, head out there to relax and enjoy the outdoor patio. It will most certainly be more relaxing than watching a Kansas State game or dealing with BCS math. Finally, the KCCGD has come BACK to Leewood, Kansas! Okay, we’re not too much into old school wrestling references, but we had to set the tone on how we felt within the walls of the 810 Zone. We all aren’t wrestling fans and we don’t live in trailers. In fact we’re pretty normal. But compared the crowd out there, we certainly felt that way. Even so, we ended up having a pretty good time. Our wallets felt the pain however. So did the Kansas State Wildcats as they tried to win the Big 12 North against Nebraska. Oh the times we had. Okay, after a road trip to Lawrence, we were back in the saddle of barspotting and what better place to do it at than none other than Coach’s Bar & Grill. 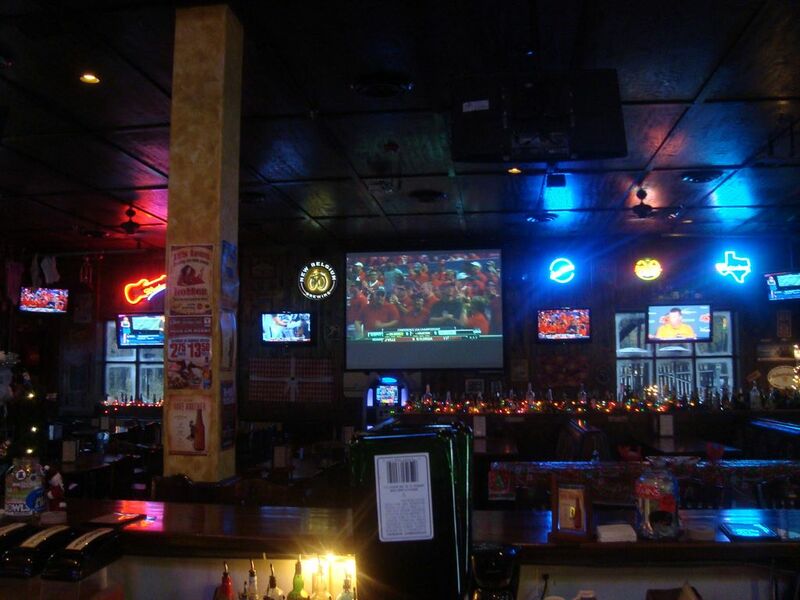 Coach’s advertises only the best in sports bars as well as being one of the oldest in Kansas City. We spotted some sweet games there and also enjoyed the festivities, it was Halloween you know. Some things surprised us and some things spooked us. Read on for some chilling tales and pray that you survive the night, er, post. Saturday was the big day. We’ve been to a couple of chain restaurants before but this one was different. This was Hooter’s. We knew everything they were pushing. The place started with girls first, then everything trickled down from their cleavage. 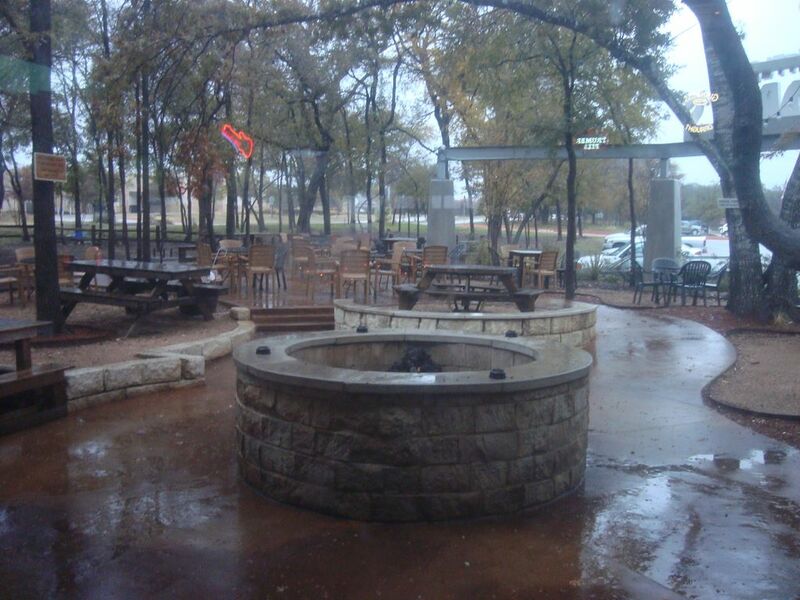 Hooter’s believes it also makes a great spot for a place to watch the game. So last Saturday was the day to put it to to the test. The test subjects included some great rivalry match ups, including the Red River Rivalry. Let’s see what Hooter’s brought us. Some weeks, you don’t know what you’re going to run into when you pick a place you’ve never been to before. 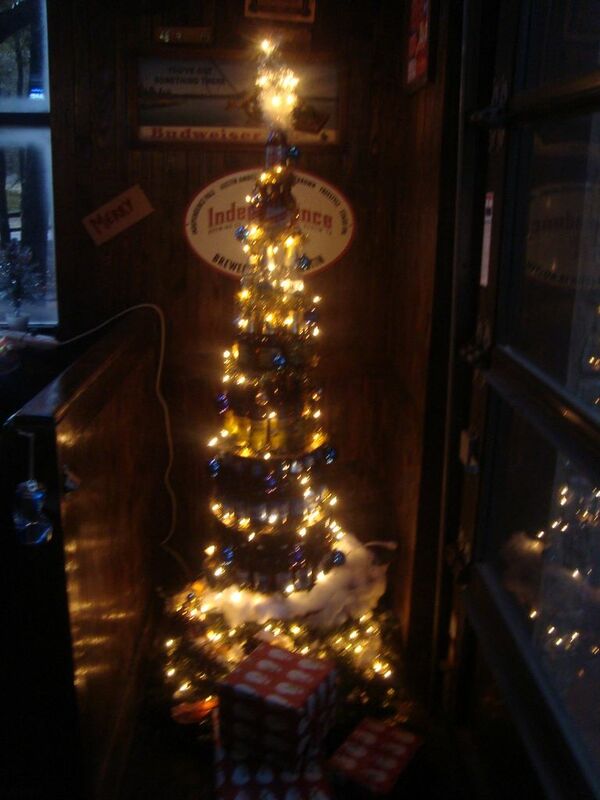 So when we strolled up to Birdie’s Pub and Grill, we weren’t expecting much. They didn’t have a website and the only information we got about the place was on Google Maps. Walking in, however, things turned completely different. Yes, it was bigger, but for some aspects it wasn’t necessarily better. The goal of the week was to watch some Nebraska vs Virginia Tech and head to a BBQ. We accomplished the mission. Here’s the report.